The masters of experiential dining - Post Dining - are embracing the cold and the dark this Winter Solstice. Adelaide’s aversion to winter is well established, but Hannah Rohrlach and Stephanie Daughtry of Post Dining want to press us to better explore the potential of our long, cold nights. This Friday, the pair’s Winter Solstice event will draw on the season’s defining features to create a dinner and festival experience that encourages guests to re-evaluate their attitude toward the season. Post Dining’s Winter Solstice event takes place this Friday, June 23. The dinner portion begins at 6.30pm, and the festival begins at 9pm. Tickets for dinner include entry to the festival, but festival-only tickets can be purchased for $10. Tickets are available here. “It’s about embracing the winter time and putting something on that is actually representative of that time rather than ignoring it,” says Steph. “Food is so intrinsically tied with the weather and the seasons, so there’s something really poignant about going in the middle of winter – on the darkest night – and thinking about how we can use food to explore that,” adds Hannah. Post Dining, which first launched with a Fringe event in 2016, has become known for hosting events that mix food, performance, and art in a way that gently pushes people beyond the realms of their normal experiences. 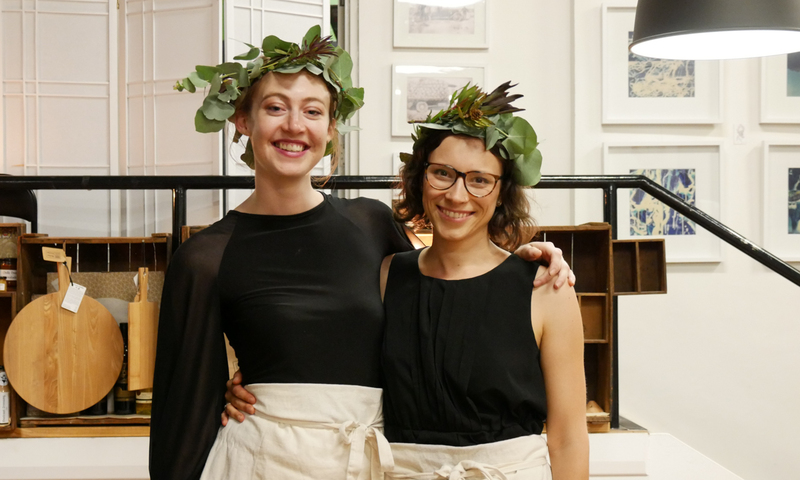 While the dinner portion of the Winter Solstice event takes winter produce – including fresh, fermented, pickled, and preserved ingredients – as its starting point, it also includes significant input from artists who have collaborated closely with Steph and Hannah. The dining portion of the evening takes place from 6.30pm, and is followed by a festival beginning at 9pm. Entry to the festival part of the night is open to people who haven’t taken part in the dinner. Taking place in the garden of The Old Exchange & Producer’s Bar, Steph and Hannah say the festival element offers a chance for people to experience what Post Dining do without committing to a full sit down dinner. “There will be local live music, we have a specific festive bar with wintery drinks set up, and some Post Dining desserts, and wintery face painting,” says Hannah. Post Dining’s intricate events are occasional, with Steph and Hannah both maintaining work in other fields. But, the pair has just graduated from the New Venture Institute’s Venture Dorm program where they explored expanding the business’ activities. While they are still considering what is sustainable for them and what isn’t, even their irregular offerings bring a new dimension to the city’s tilt at innovation and – in the case of this week’s event – a little flicker of warmth to a cold night.